Wedding Salwar Kameez Collection in for season style with patterns and styles from Anarkali suit dresses to Punjabi suits is what anyone will want to carry for comfort. Most ladies love to dress simple and comfortable and salwar suits at weddings are also their best option compared to drapings sarees. We provide a wide range of Wedding salwar suits collection which gives and caters the taste of young women and of all ages from dressing simple in churidar suits and palazzo suits to heavy wedding anarkali suits for a wedding wear. 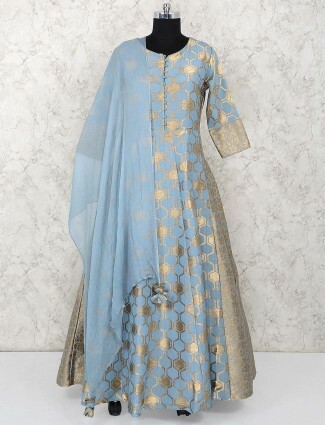 Choose from trending styles of wedding salwar kameez in silk, satin, crepe, cotton silk, chanderi, velvet and others designed in new patterns and cuts for a complete new look of indo western styles to basic desi style to carry at a wedding are all available at G3fashion.com.